Surround Architecture, an award-winning design firm located in Boulder CO, is currently accepting applications for a talented Designer to join the team with a minimum of 4 years of applicable experience. Our studio has an immediate need for a creative and detail oriented self-starter who can operate within a variety of design phases. • "Designer - Your Name" in the subject of the email. • Cover letter in the body of the email. • Resume in PDF format. • Portfolio in PDF format or website link. • Send to - info [at] surroundarchitecture [dot] com. No phone calls or walk ins, please. Applications that do not follow the above directions will not be reviewed. Introducing one of our newest residential projects here in Boulder -- Pleasant Ridge. Uniquely situated within rural fields to be planted with hay and alfalfa, the orientation of the home and barn aim to take in the sweeping views of the foothills from the west through the north as well as the horses grazing from framed views within the home. Strategic placement of native vegetative screens and structures provide wind breaks and focus views towards the foothills and the inner courtyard this orientation creates. A subdued material palette and utilization of traditional rural forms along with the restoration of agricultural use to the site aims to reflect the characteristics of the land and adjacent properties. This week we're punchwalking and wrapping up our commercial TI work for the new office space of Lems Shoes, a local shoe company dedicated to "creating sustainable shoes that consider the foot above all else." The material palette reflects both the creative energy and draw to the outdoors behind the Lems brand. This includes Wyoming snow fence, oiled MDF, peg board and gymnasium lockers with accents of chartreuse infusing energy into the custom shoe display, steel girders, and interior garage door. We've kicked off a new residential project here in Boulder we call "Brookside." Sited on a heavily wooded lot, out clients loved the idea of connected with the surrounding foliage, tree canopies, and sounds of the nearby creek as if living up in a treehouse. Shown here in the rendering of Brookside, the projecting steel and glass boxes serve to provide this feeling of living out amongst the trees. Follow along with the progress of this home at our Instagram project hashtag #sa_brookside. We're kicking off a new project we call "View Point." We work with a lot of gorgeous sites in and around Boulder, but View Point may be one of our new favorites. Below are some earlier facade and material studies as we diagram and tie in surrounding views and site conditions. This summer we wrapped up our residence "Aittin." We have finally made our way through editing photos and are excited to post the project here on our site. This home is uniquely situated over a little creek with wonderful mature foliage and views of the foothills out the back. Click into any of the photos for the full set of images. We've been fine tuning the landscape, exterior materials, and interior finishes of Sunset. 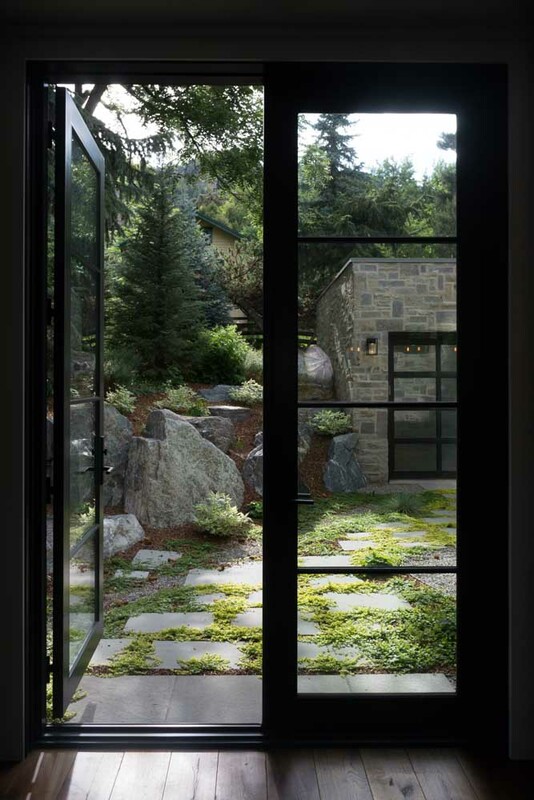 Working with Marpa Landscape, the approach of the house is shaped by steel and stone sitewalls that form a courtyard housing niwaki trees. As seen in the rendering, these elegantly sculpted trees are larger, planted (not potted), and more sculpted than their bonsai counterparts. Chickadee's making great progress, from rendering to the deconstruction of the existing home, to the build of the new simple gabled structure. A breezeway connects the main living spaces to the garage. We're excited to introduce one of our new residential projects....Bierhaus! The close proximity to some of Boulder's most trafficked hiking destinations provides the challenge of embracing the immediate view of the foothills as well as creating privacy from the foot traffic of the hillside. The form--as shown in our rendering above--is the result of this balance and specific orientation of views. Reinforcing that orientation is the metal roofing that wraps down from the gabled slope to create the walls below. Keep an eye out for progress shots of Bierhaus as we are eager to break ground.